Export to Outlook for Excel is an application allowing to export Excel or CSV format contact information directly into Outlook. 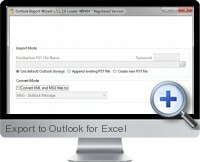 The export process is easy to execute as Export to Outlook for Excel employs a wizard type approach to select the data file, specify export options and finalize the export to Outlook. Supports data formats in XLS, XLSX, XLSM and CSV. Map columns to contact information including first name, last name, full name, job title, company name, primary email, business phone number , business fax number , mobile phone number, and more. Data preview window is provided for verification before the export is executed.